Arches National Park is near Moab, Utah. The park has over 2,000 natural stone arches, hundreds of pinnacles stretching into the sky, enormous rock fins and huge balanced rocks. The park offers a variety of things to see and do. Many visitors enjoy the breathtaking red rock scenery from the car. Others enjoy the short family-friendly hikes scrambling up rocks and fins and around the arches. Those who prefer serenity away from the crowds will set out on longer and more primitive hiking trails. 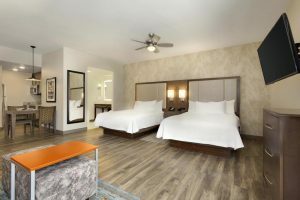 The park offers something for everyone. The park’s main scenic drive is paved and offers photo opportunities from the pullouts along the road or in the parking lots. Some of the arches and landmarks can be reached by a short walk from the parking lot. The full 43-mile drive, including the spurs, takes 2 to 3 hours. Add more time if you plan to do any hiking. Balanced Rock is one of the most popular features in Arches National Park because it’s located next to the park’s main road. There is an easy, short loop hike of .3 mile round trip that takes you up to, and around, this landmark. A fun fact: the balanced, upper portion of the rock is as large as three school buses. The top of any list when visiting Arches is usually Delicate Arch. This free-standing arch is one of the most famous geologic features in the world. You cannot see this arch from the main road; you must get out of the car to view it. At Lower Delicate Arch Viewpoint simply walk 100 yards along a level path to view the arch one mile away. The Upper Viewpoint requires walking ½ mile with some stairs. To see the arch up close, the trail is 3 miles roundtrip and climbs 480 feet in elevation. Don’t underestimate the trail’s difficulty, the summer heat or winter ice, or your own health and fitness when considering hiking this trail. Delicate Arch is a popular destination for tourists and photographers. Please practice patience and courtesy while taking photographs around the area of the arch. At sunset, there may be hundreds of people and photographers lined up along the bowl waiting for the magical moment. 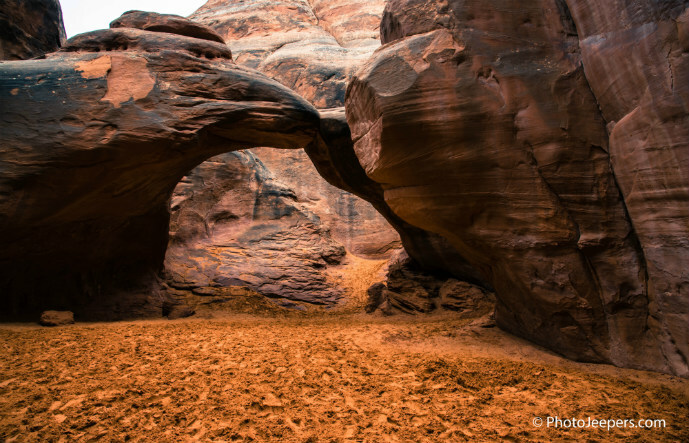 Take a journey through narrow canyons and maze-like fins in the Fiery Furnace. The area is safely explored on a 3-hour, ranger-led hike for which advance reservation is necessary. Learn the history of the park as you scramble over boulders, walk through sandy pathways, shimmy down between rocks and navigate narrow ledges. 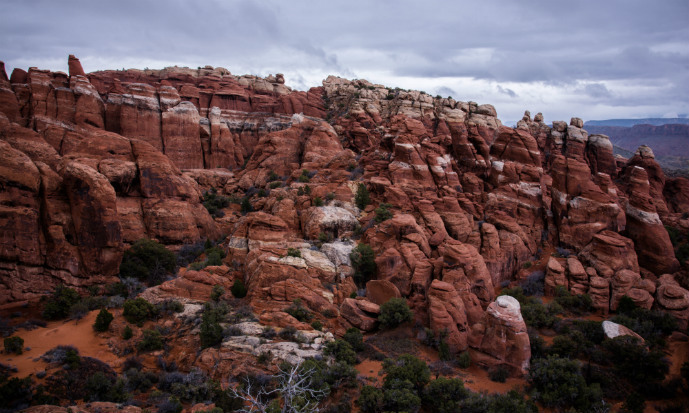 If that sounds too adventurous, the Fiery Furnace Viewpoint is a short walk from the parking lot. From the overlook you see an area thick with fins, spires and arches. 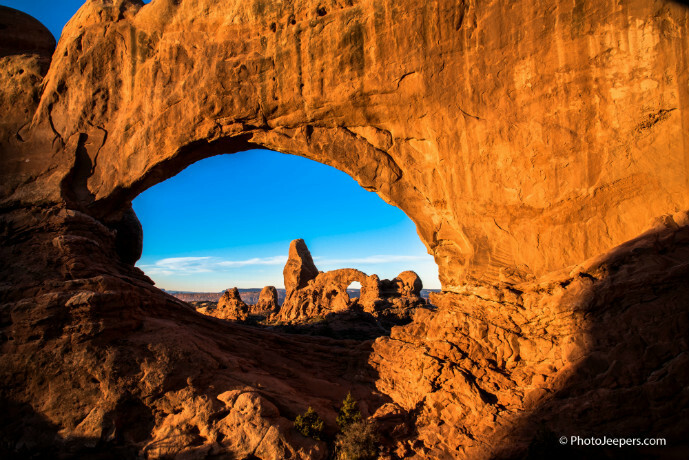 This incredible arch is accessed by walking 1.6 miles along the Devil’s Garden Trail. Landscape Arch is actually longer than a football field with the thinnest part of the archway being 8 feet thick. Photograph various angles of the arch. Each view along the trail provides a different perspective. There used to be a short spur trail passing underneath the arch, but falling rock from the underside makes it too dangerous for visitors to walk beneath the arch. The Devil’s Garden Trail is the longest maintained trail at Arches National Park. The trail is 7.2 miles round trip, including all spur trails. The area includes the largest concentration of significant arches in the world. Most tourists will take the well-traveled, easy hike the first 1 mile to the famous Landscape Arch. Along this section you can take spur trails to see Tunnel Arch and Pine Tree Arch before coming to Landscape Arch. The trail after this point requires climbing up and over long, narrow sections of slickrock, called fins, with steep drop-offs. 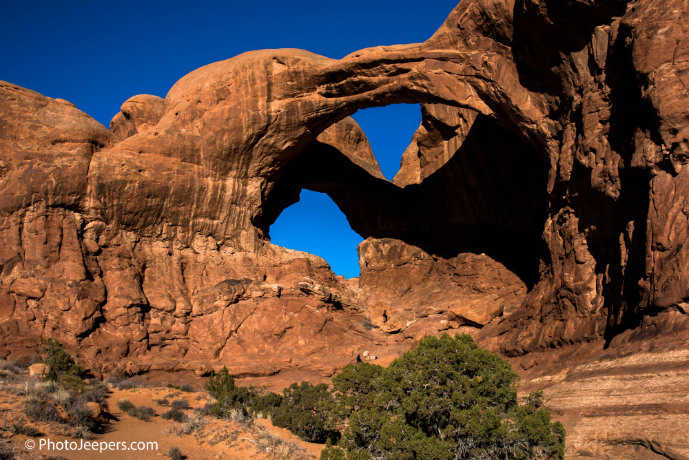 Those opting to continue the hike will see Navajo Arch, Partition Arch and Double O Arch. The area known as the Windows is accessed by an easy, 1 mile round trip trail. These two arches, North and South Windows, are also known as the Spectacles. Many view these arches only from the parking, but take time to hike up inside them to appreciate their massive size. Walk along the primitive trail from the South Window to the back side to see a more attractive view of these arches. Get here early if you want photos of the arches without people. The Windows area is easily accessible and very popular. The park puts on a show at sunrise and sunset. The colors are vibrant and the light creates a spectacular glow on the red rocks that cannot be missed. Turret Arch is one of the best places to watch the sunrise and see the light dancing across the rocks. The colors of the sky at sunset behind this arch also make it a good location as the sun sets. This arch is aptly named because it consists of two arches that share the same stone foundation. Double Arch was formed by downward water erosion instead of the side-to-side water erosion of the many other arches in the park. 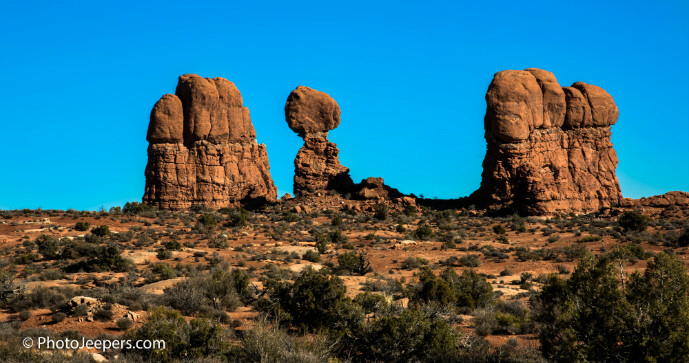 As you hike to Double Arch you pass the Parade of Elephants, a rock formation that resembles a herd of elephants holding each others’ tails. Enjoy the short, leisurely trail. This is one stop in the park that provides shade, cool sand and fun for kids. The easy hike takes you into a small slot canyon with many areas to explore, play and hide. Remember climbing on top of arches is against park policy. On a clear night, the sky is brimming with stars. 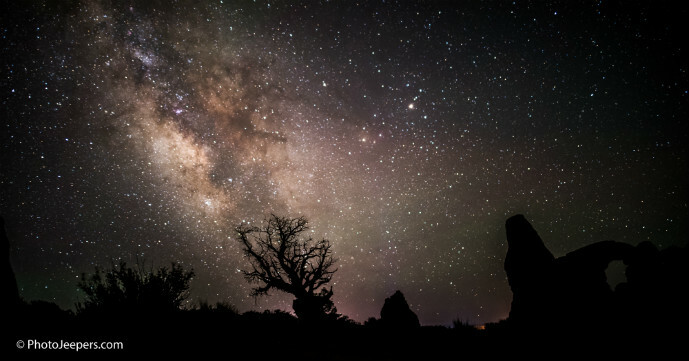 Arches National Park is recognized internationally as one of the best places for stargazing because of its accessibility, remote location, altitude and weather. There is a slogan that says “Half the Park is After Dark”. Take the time to linger in the park after dark and LOOK UP! We visit Arches National Park multiple times each year. We recommend visiting during the winter off-season. If you must visit during the summer, hike in the morning or late afternoon to avoid the extreme sun and heat during mid-day. There are not many places to find shade along the trails in the park. Or even better, consider a moonlight hike along the easier trails when the temperatures are cooler. Visit the Arches National Park website for more details of the park. 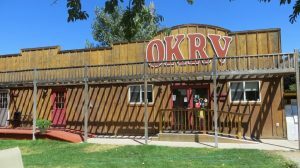 Here are my top picks for accommodation in Moab which is a central place to base yourself for exploring Arches National Park. David enjoys photography and exploring areas off the beaten path in the jeep. 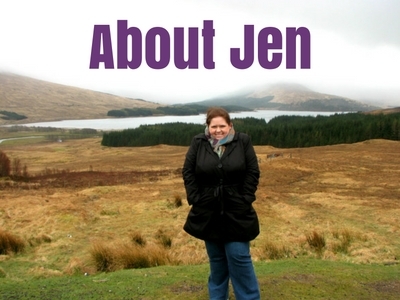 Jamie plans and organizes the travel itineraries and details. We share our photos and stories to Inform and Inspire you to explore new places and capture your adventure with photographs. 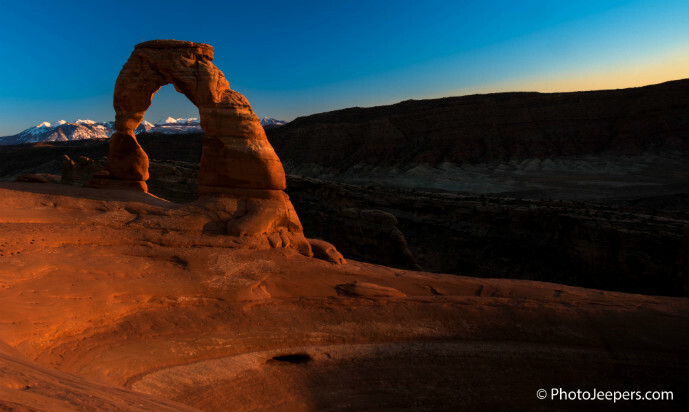 Contact us if you have questions about Arches, or any other National Park in the Western United States. 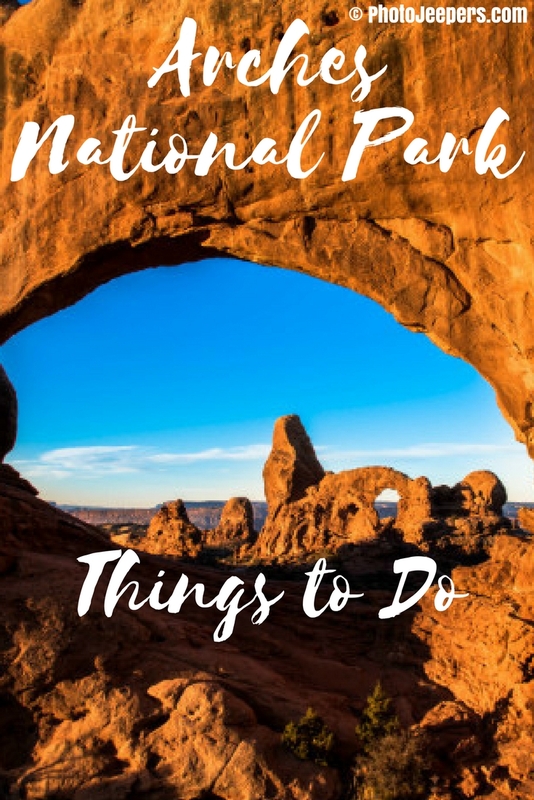 Which of these things to do in Arches National Park are you most interested to do? Utah is such a crazy state with some amazing rock formations! 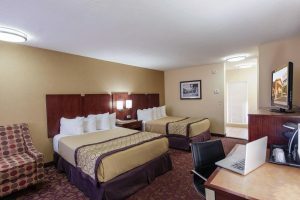 I would love to go back and spend some proper time exploring seeing these photos and it’s you’ve included a spectrum of accommodation options – very helpful! Yes, Utah is amazing, and each National Park has different rock formations. It’s fun to explore them all! I’m hoping to visit some of Utah’s national parks in May. I suppose it will be rather hot, but I think I’ll risk it to see the beauty or Arches. Thanks for the detailed guide – I’ve pinned it so I can come back to this when I start planning! May won’t be too bad, just be prepared for warm days and cool nights. Also know that Arches is doing road work at night from March through the end of the year and visitors must be out of the park from 7 pm to 7 am so plan accordingly. Have so much fun!! All of the National Parks are beautiful, but Arches is certainly one of my favorites. You captured the colors beautifully too! Thank you. We’ve perfected our photography skill at Arches by going there multiple times during the year for many years. It’s our favorite place! Arches is amazing, especially since you never know how long the arches will remain standing. Thank you about the photos. Yosemite is gorgeous! 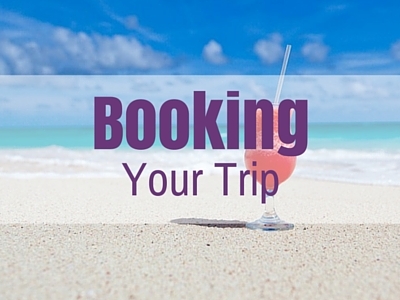 Zion, Antelope Canyon and Joshua Tree are also on our list. 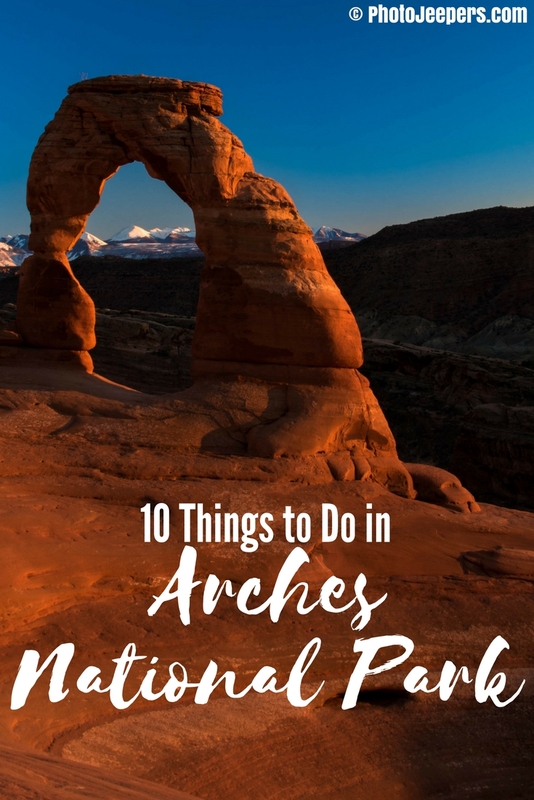 Fantastic guide to Arches National Park! I didn’t realize that so many of the landmarks were so easily accessible – for some reason I always imagined that you’d have to hike HOURS AND HOURS to get to them. I’d love to make it to this park one day! The majority of the arches are a short hike. There are only a few that require a hike farther than a mile. 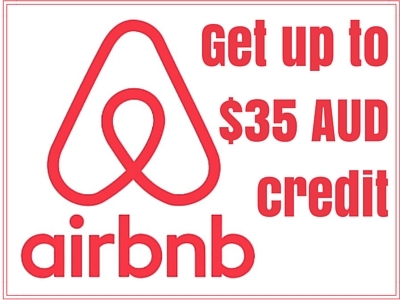 It’s a popular destination for this reason. I hope you can visit one day! Thank you so much for sharing amazing information about Arches National Park. The park offers a variety of things to see and do, It’s really a fun to explore them all! Full of unique arches and other rock formations. Thanks again for sharing such a wonderful post!